Following coljenn’s deportation to some godforsaken corner of Austria, Garry Clarke has taken up the mantle of reporting on the gaming exploits of their local game group and has set up a blog called ….. bet you can’t guess? Yes, well I know the clue was in the title but, all the same, it’s good that we’ll continue to see how their gaming compares to what we get up to. Link here. This week’s session of the Shrewsbury Boardgames Club on 30th November will be held at Nige’s house. I can’t attend due to our work Christmas do being that night. I was amazed to find a copy of Perikles today in the local TK:Maxx. Only Â£9.99 so couldn’t resist. This is the only Warfrog game I’ve not bought at Essen in years (and that was only because I forgot to go back at the end of my second day to collect it). There was also a copy of Reiner’s Beowulf (not the Movie version) and Mensa Connections but I already have both of those. If you’re interested in any of these games, it may be worth a visit. After missing last week’s session as I was in London, the next session on Friday 23rd November is back at Garry’s house. 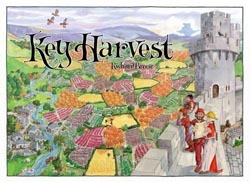 This week, there were four of us so I decided to try out Richard Breeseâ€™s latest game, Key Harvest. I was looking forward to this as the â€˜Keyâ€™ series of games has been filled with very good game ideas. The idea behind the game is to score points by developing plots of land through planting and harvesting fields of particular crops and employing workers to help farm the land. A playerâ€™s turn involves taking two out of four possible actions: Firstly, you can initiate the sale of a plot of land, placing it in your store and setting a price in crops (weâ€™re a bartering economy here) for that plot; you can buy a plot of land that has been offered for sale by you or another player, by paying the required combination of crops, and then immediately cultivate it; thirdly, you can employ a worker in your fields and he will give you an immediate benefit (such as awarding you a free harvest or recultivating an already harvested field); and finally you can harvest a group of fields to obtain the crops sown. Whenever plots of land are put up for sale, the market either brings a new plot onto the market or an event occurs. The events interrupt play and give players additional opportunities for developing their position. Once ten events have been drawn, the game ends and scoring takes place with points awarded for each worker employed, each playerâ€™s largest and second largest groups of fields and having the greatest stock of each type of crop. There are some very good ideas in the game and there is a lot of angst in deciding which actions to take â€“ you always want to do more than is available to you. However, our game suffered from the non-appearance of events: we went through six events pretty quickly and then they just dried up â€“ I think the next event turned up over an hour later and, by that time, we were all pretty sure I had the game sewn up that we decided to call time a short while after. We all noted that it was pretty difficult to get the townsfolk into play and I was the only one whose field network really helped bring them into play: I managed to get one of the level 5 and two of the level four guys working for me, whereas only Mark G managed to get a level four worker into play. I think the others were a bit disappointed â€“ the first half of the game played really well but the tile draw meant that things stagnated badly. Iâ€™m not sure it was helped by the way we played as everyone was discouraged from putting things up for sale because, whatever the price set by the person initiating it, the other players were doing their utmost to stop that player from getting it. A bit of negative group-think. However, I would hope that with a better distribution of events and more competition for the townsfolk, another playing should restore my faith in the game â€“ certainly other reports have been pretty positive. This week’s session on Friday 16th November will be at John’s house, as I am taking Jan down to London to see The Sound of Music. Alea has a very good reputation with me and I always look forward to their next game with interest. 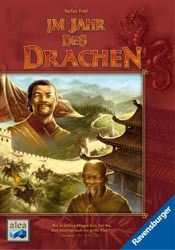 Although the English edition of their latest didn’t make it to Essen (Year of the Dragon by Rio Grande), I did get the German version and five of us sat down to test it out. Players are Chinese rulers around the year 1000 andÂ you are trying to protect yourself and your subjects as best as you can against disease, hunger or attacks from the Mongols while gaining prosperity and prestige. The game is played over 12 months (rounds) and each month is split into four phases. Firstly, each player picks one of seven possible actions, most of which activate workers in your palaces and gain you food, money or prestige points. In the second phase, you can recruit a new worker providing your palaces have space to accommodate him. Thirdly, an Event then takes place which, from the third month onwards, requires you to satisfy certain conditions (pay taxes, give up rice stocks etc.) If you are unable to meet the “cost” you will lose workers and, if your palaces then become uninhabited, they start to decay. Having dealt with the event, scoring takes place and you receive prestige points for each of your palaces, any court ladies you have recruited and any privelige tiles collected. After the 12th round, a final scoring takes place with bonuses for workers, buddhas and money remaining, following which whoever has the most prestige wins. This is a very unforgiving game and, as you are bound to suffer some losses at some point during the game, you need to work out when is going to do least damage. Forward planning is critical. When we went through the rules, Nige thought it might be more fun to have the event tiles laid face down but we soon discovered that would have made the game impossible. I made a big mistake in one round, failing to anticipate exactly how much cash I was going to need two rounds later and it killed me. I hadn’t been doing brilliantly before then (paying 3 coins for my chosen action a few times as I was lagging behind on the person (turn order) track). However, my cashflow problem devastated my palace population and I knew that I was never going to recover. Nige was heavily into research and early on was raking in the prestige points. However, Mark K gave him some competition in research and that slowed him down. Mark G collected some priveliges and this brought him lots of points in each subsequent scoring but he, like me, got hit hard by events. Steve, on the other hand, managed to take some modest pain early on but then was able to build up a good cluster of palaces and crucially had buddhas in them at the end to score enough points in the final round to overtake Mark KÂ and tie for prestige with Nige. Unfortunately for Steve though, Nige was further advanced on the person track and claimed the win on the tiebreak. This was another high quality game from Alea and designer Stefan Feld is making quite a name for himself with this joining Notre Dame as a big success.